You are viewing the archived Ice Cream ratings. Follow the link to view the current Ice Cream rating page. 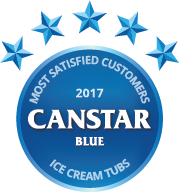 Compare ice cream in New Zealand at Canstar Blue. Mövenpick, Cadbury, Countdown Select, Deep South, Kapiti, Killinchy Gold, Lewis Road Creamary, Much Moore, Pams, Signature Range and Tip Top were compared for value for money, variety and range, taste, packaging appeal and overall satisfaction. Canstar Blue research finalised in June 2017, published in August 2017. Mövenpick scoops five stars in Overall Customer Satisfaction. For most of us, the Kiwi institution that is Hokey Pokey is still king, although this year it shared the title of favourite flavour with chocolate. The surge shown by Cookies and Cream in 2016 slowed a little and it only managing bronze position on the podium this year. That said, it still remains very popular amongst GenYers. The mixture is then cooled to around 2 degrees and is left to partially thicken into a paste. Once the ice cream has thickened, any flavours and sweeteners are added. The final product is then poured into tubs and stored in a freezer to harden before being shipped off to your local supermarket. Of course, this is a very general explanation and each company will have its own unique methods. 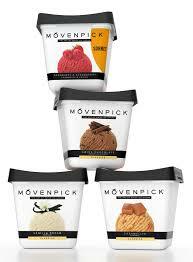 The 2017 winner of Five Stars for Outstanding Customer Satisfaction, Mövenpick produces a premium range of Swiss ice creams and claims to use only the finest ingredients with no artificial colours of flavours. New Zealand brand Lewis Road boast peanut butter flavour amongst their premium range and rose flavour in their artisan range. Tip Top is an iconic New Zealand ice cream manufacturer that produces many Kiwi favourites, including Trumpet, Jelly Tip, Choc Bar and, of course, Hokey Pokey. Canstar Blue commissioned I-view to survey 2,500 New Zealand consumers across a range of categories to measure and track customer satisfaction. The outcomes reported are the results from customers who have purchased and eaten ice cream tubs in the last six months – in this case, 1,865 New Zealanders.